"I don't see race. People tell me I'm white and I believe them because (insert hilarious quip here)." This is one of my favorite Colbert Report bits, because it shows just how ridiculous it is to claim to be color-blind. We're not color-blind and we shouldn't be, we should see and celebrate all our beautiful colors, despite the difficulties that may come along with it. 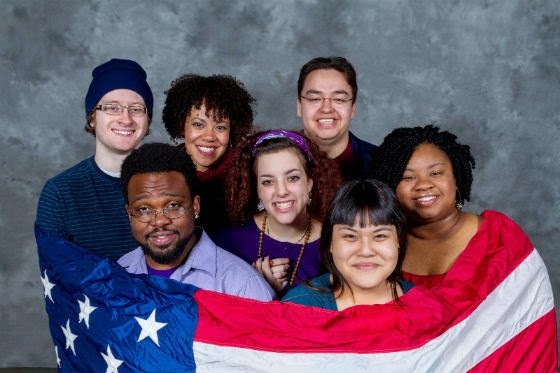 nimbus theatre's new original work Nacirema (American spelled backwards) explores this and other ideas about race in America. Presented as a series of vignettes written by nimbus' Artistic Directors Josh Cragun and Liz Neerland, along with the seven-person ensemble, it's a modern, thoughtful, innovative, and entertaining take on the issue. The show begins with the cast visiting Nacirema Travel Agency, illustrating the mostly horrible ways people ended up in this country. A spoof of local news shows us how skewed it can be, with hilariously sing-songy voices by Ernest and Simone, and stories featuring homicide, sports, and weather. A QVC sale of the "token friend of color" is funny and dead on and might make you squirm a little. A scene on a bus with few words spoken shows us what's really going on inside people's heads as characters hold up signs that display their thoughts. It's quite telling, moving, and disturbing. In some of the most beautiful scenes, each of the seven ensemble members describes her or himself in terms of food, which I assume they had at least a part in writing. These monologues are all lovely, diverse, and poetic, like spoken word performances. What starts out as a fun dance party with Alsa calling movements and the cast performing them turns into a sobering police encounter. Alsa's painting show (think Bob Ross painting a crack house) is really funny, playful, and surprisingly poignant. Dana and Nastacia embrace and celebrate beautiful natural hair! The cast stands at the front of the stage and takes turns saying some of the stupid and insensitive things people say. A lovely song by Dana and the cast ends the show, with beautifully diverse images of famous Americans displayed on the screen. I'm a little late to this party - nimbus theatre's Nacirema closes this Sunday. But if you have time this weekend, I recommend checking it out for some entertaining, thought-provoking, challenging, creative theater.